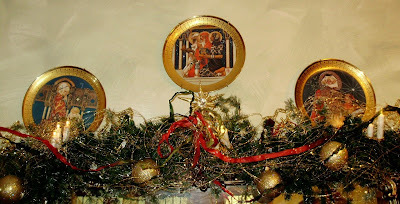 Martha's Favorites: IT IS BEGINNING TO LOOK A LOT LIKE CHRISTMAS! 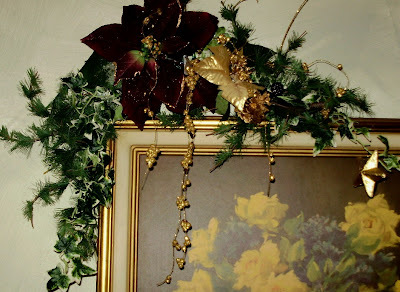 You can't tell by the pictures I have posted but, I have a handle on the decorating. I have spent the last 2 days put things away that are not Christmas. I am only going to leave a small amount of Thanksgiving items out, because I am having the big dinner at my house. I love the formality of Thanksgiving. It is the one day, I don't get teased for having the table all dressed up. I live with men. They have a little trouble appreciating the "bling" in life. It's beginning to look a lot like Christmas! Men, they just don't appreciate our need for some bling! I pray things go well for your daughter tomorrow and she gets the outcome she desires. I know you would love more grandbabies to spoil too! God bless and take care. Christmas is right around the corner! Your decorating is looking wonderful! Prayers for your daughter. Thanks so much for stopping by my blog and entering the giveaway, I just wanted to say Hello and good luck! Your things are always so beautiful..I so enjoy looking thru your blog. And I will definately say a prayer for your daughter Monique. Hugs for you both.. I am excited to start decorating too. I never dare do anything until after Thanksgiving. I have a huge crowd and it is all about the turkey day, but the min. they leave, out comes the tree. lol Yours is looking great! I'll be back to see the rest. That's a great idea...to start putting away non Christmas things. I hope to have everything up, except for the 3 trees, by Thanksgiving day. Hi Martha! Thanks for visiting and following my blog and giving me the chance to find you! It's beautiful here and I love your pretty layout! Sincerest best wishes to your daughter for the best possible outcome. I did the same thing many years ago so I really pray that all goes well for her. 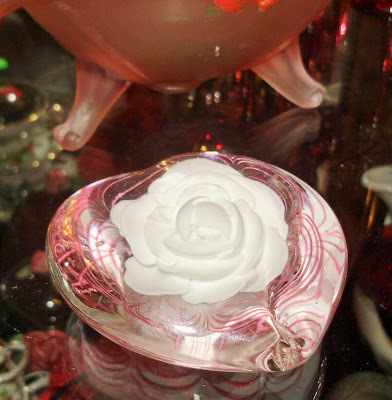 I love all your pretty pink, especially the paperweights. I will have Monique in my thoughts and prayers and hope for a good outcome. Whooo hooo Martha! You do a fabulous job decorating and I love your photos! 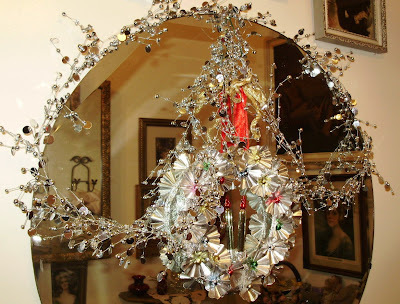 I love your christmas mirror and the plates... you always show the most beautiful things. I love this music! I have this Michael Buble cd. Your home is beautiful! 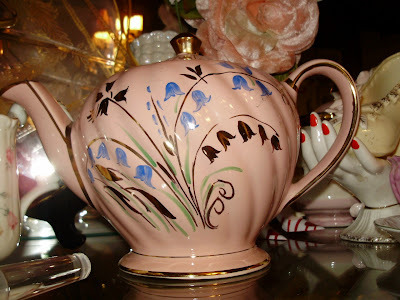 I love that pink tea pot. Is it a paperweight? My hubby actually wants to decorate for Christmas. I think I might just give in this weekend as we are not having Thanksgiving at our house this year. 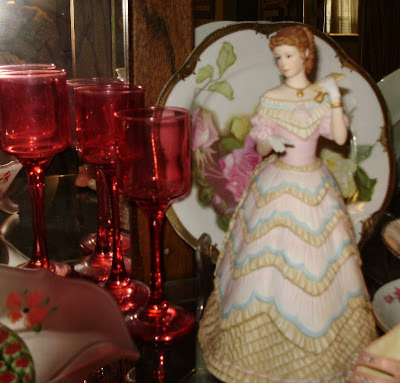 I love the touches of pink you've found to share with us today. They are lovely. I hope you have a wonderful Pink Saturday. May all go well for Monique, she will be lifted in prayer. What lovely touches of Christmas, you have the touch, Martha. I love your Fenton pieces. 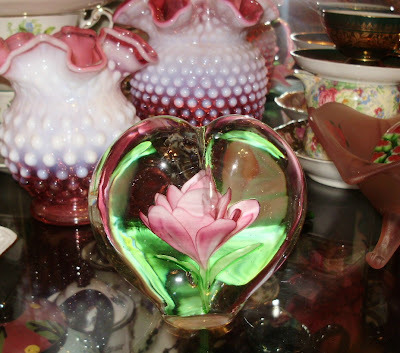 My Mother had a couple of pieces just like those, I am not sure what they are called. Martha, you always share such pretty things. I love it all, and the hobnail is my favorite. I've been in a decorating dilemna, too. Which to do?